1984 FERRARI 512 BBi – Daniel Schmitt & Co. Finished in classic and desired Rosso Corsa Red with impeccably kept Tan leather interior. This magnificent motorcar is among one of the finest examples we have seen in many, many years. It is with great pride that we offer this exquisite example to the most astute collector, investor and enthusiast who demands the best. 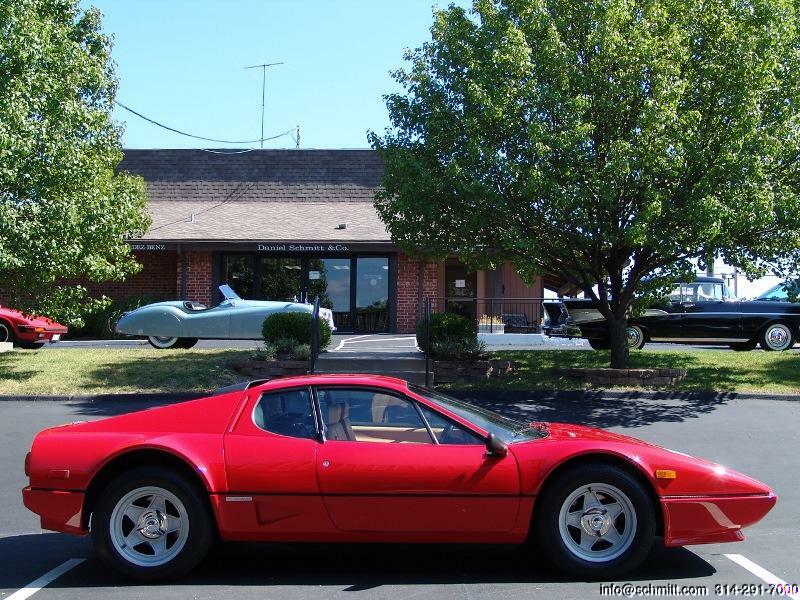 This great motorcar is one of the last hand-built Ferraris and I personally believe the investment potential will grow far beyond your imagination. This is an opportunity to own one of the best at an investment price. Bid with confidence  you will not be disappointed in this truly magnificent motorcar. History of the Boxer: The prototype Boxer made its debut at the Turin Auto Show in 1971, its top speed by Ferrari listed as a heady 188 MPG. When Enzo Ferrari finally decided to build this particular car, he surprised everyone by using a flat-12 engine rather than a B-12. The long and low power plant appeared first in the companys formula one cars during 1964 and 1965, then made its return in 1969. Further refinement issues were addressed in 1976, with the introduction of the Ferrari 512BB. The new name signified the engine 5.0 liters and 12 cylinders. Rear track increased by 1.7 inches and the body was 2 inches wider and 1.5 inches longer than Daytona. The front end had a small chin spoiler, and Naca ducts helped rear brake cooling. At the 1981 Frankfurt Show, Ferrari introduced the final and arguably most superior version of the series, the fuel-injected Ferrari 512BBi. This would prove to be the most popular of the entire BB series; the Ferrari 512 BBi looked almost identical to its predecessor, save minor exterior details such as badging, but its flat-12 featured Bosch K-Jetronic fuel injection instead of multiple carburetors and used a Digiplex ignition system. The close Boxer production in 1984 represented yet another milestone in Ferrari history. It was something special,  said builder Sergio Scaglietti, whose firm made the bodies. It was the last car where we made everything by hand. The example offered here is no exception. This car was imported by European Auto of Costa Mesa, California. This final year 512 BBi has traveled just over 19,720 kilometers since that time and has long been part of a collection of special cars.